Ryan Garcia (15-0, 13 KOs) looked sensational in defeating the highly experienced Jayson “La Maravilla” Velez (26-5-1, 18 KOs) by a lopsided 10 round unanimous decision on Friday night on ESPN. 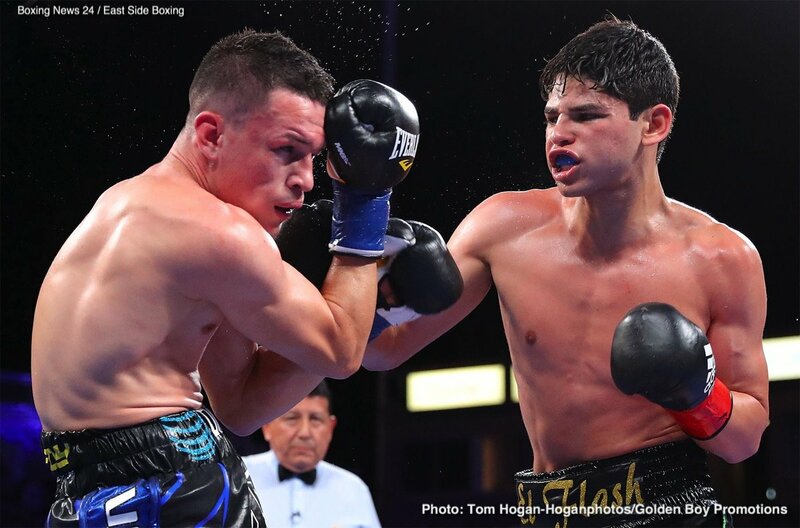 Garcia, 19, was barely hit in the fight in coming close to shutting out the 30-year-old Velez at the StubHub Center in Carson, California. The scores were 99-91, 99-91 and 99-91. This was a step up fight for the Golden Boy prospect Garcia, and handled Velez like a seasoned pro in moving, hitting and tying up the Puerto Rican fighter for 10 rounds in a nice victory. In the 1st round, Velez went on the attack and landed several hard shots. Garcia was taking it easy on Velez in the opening round to see what he’s got. After the 1st, Garcia turned up the heat on Velez ad began to pepper him with jabs and power shots. Velez realized that he wasn’t having any luck while on the outside, so he started to fall forward, crashing into Garcia. Velez wasn’t able to do much when on the inside as Garcia was able to tie him up to keep him from getting his shots off. Garcia kept on the outside as much as possible, circling the ring, hitting Velez with hard jabs and then grabbing him to keep him from getting his shots off when he would crash forward. In round 7, Velez landed a good right hand to the head of Garcia that got his attention. Velez kept putting pressure on Garcia, and hitting him hard. In the second half of the round, Garcia started catching Velez with right hands when he was coming forward. The shots landed perfectly, and he was able to get the better of him. Velez took Garcia’s best shots in rounds 8 through 10, and kept coming forward looking to land his big power shots. Velez was catching Garcia, but his punches weren’t connecting cleanly enough for him to win the rounds, Garcia was smart to make sure that he was always far on the outside and not near enough to be hit by Velez’s shots. Velez fought well enough in the last four rounds to make Garcia struggle and stay on the move. Velez has a style that makes it hard for any fighter to look good against him. In the 10th, Velez unloaded on Garcia with everything but the kitchen sink, but he still wasn’t able to dominate the action. Garcia was still the better fighter of the two. In other boxing results on the card, middleweight contender Gary “Spike” O’Sullivan (28-2, 20 KOs) showed off his formidable power in beating stopped Berlin Abreu (14-2, 11 KOs) by a third round stoppage in what could be a dry run for a fight against Saul Canelo Alvarez in September for the Irish fighter. O’Sullivan used his punching power and size to tee off on Abreu in round 3. The first two rounds had gone O’Sullivan’s way thanks to his huge punching power. In round 3, O’Sullivan hurt Abreu with some big shots. Abreu then spit out his mouthpiece to try and buy some time. The referee saw through Abreu’s tricks and he took a point away from him. After the 3rd, the referee called a stop to the mismatch. Previous boxing news: GGG-Martirosyan: Will Vanes become Don King’s last-ever world champion?